UPDATED: 10:45am -- Matthew Chance and Jomana Karadsheh are among the more than 30 journalists who have safely been released from the Rixos hotel. 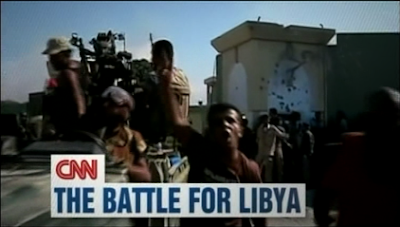 CNN Domestic and CNN International continue to cover events in Libya as rebel forces and pro-Gadhafi fighters battle for control. CNN has been deploying resources and journalists to the country since Sunday when rebel forces entered the capitol of Tripoli. CNN journalists currently on the ground in Libya include: Sara Sidner, Matthew Chance, Jomana Karadsheh, Arwa Damon, Frederik Pleitgen and Dan Rivers. Ben Wedeman, CNN's senior international correspondent based in Egypt, remains in Cairo dealing with family matters, but is offering insight and analysis throughout CNN's broadcasts. Wedeman was one of the first Western journalists to enter Libya following the outbreak of protests in February this year. CNN says Phil Black, Jim Boulden, Leone Lakhani and Nina Dos Santos are working the story from London, focusing on the political and business sides of the fast moving story, whilst Nkepile Mabuse continues to offer an African perspective on events from her post in Johannesburg, South Africa. John Defterios is currently reporting out of CNN's Abu Dhabi bureau with reaction and analysis from Middle East regions. Barbara Starr, Jill Dougherty and Atika Shubert are also continuing to contribute to the network's ongoing coverage from Washington and Paris, respectively. UPDATE: ALL JOURNALISTS HAVE BEEN FREED FROM THE HOTEL SAFELY. Matthew Chance and Jomana Karadsheh are just two of the 30 or more foreign journalists currently being held against their will by pro-Gadhafi forces at the Rixos hotel in Tripoli. At the time of this post, the reporters are entering their fifth day locked in. Chance has been regularly phoning in to CNN to update his status. Read more about the hotel lockdown from CNN here. Sara Sidner has received widespread praise following her live reporting as rebel forces penetrated Gadhafi's compound. Below is just one moment from her compelling coverage. To Mr. Producer:We hope you will get better soon.